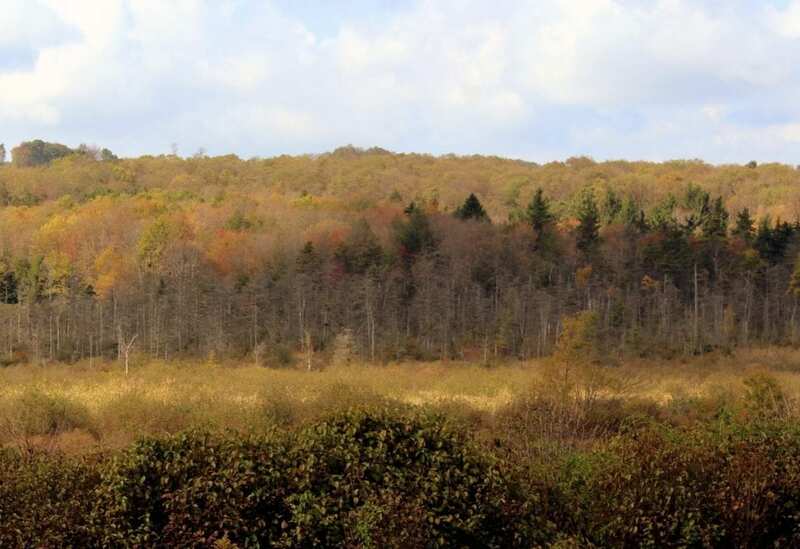 Cranesville Swamp Preserve is a nature sanctuary that protects a 1,600-acre natural area in eastern Preston County, West Virginia, that includes a highland boreal bog within which live several species of plants indigenous to the northern U.S. and Canada. The tamarack, or eastern larch, reaches its southernmost natural extent in the swamp. Part of the preserve is located in Garrett County, Maryland. The swamp is situated in a natural bowl, or “frost pocket,” which supports a micro-climate more consistent with that climate of more northerly regions. Its unusual setting allows 19 different plant communities to flourish, including that of sphagnum moss, speckled alder, and various grasses and sedges. Bog species include round-leaved sundew, narrowleaf gentian, and pitcher plants. The swamp is also home to the southernmost natural community of eastern larches, known locally as tamarack. Tamarack is an Algonkian word that translates “wood from which snow-shoes are made.